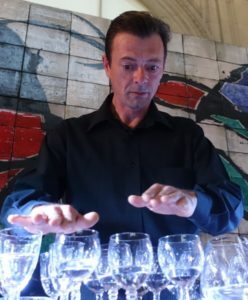 Robert Tiso Is an English-Italian glass harp and glass harmonica player. His musical education began at the age of 15 learning classical guitar and later on he studied music theory and sound engineering at the Academy of Art in Urbino (Italy). 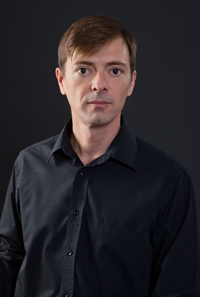 He performed as guitarist for two years with Compagnia Autonoma Tenenti and later was music director and live performer for the internationally acclaimed puppet show “Mano Viva” by Girovago & Rondella Family Theatre. His interest for the glass harp started in 2002. After collecting a set of wine glasses for what was supposed to be a random musical experiment, he discovered that an instrument called “musical glasses” was invented almost 300 years earlier and many composers used it in their works. Intrigued by the fascinating sound, Robert mastered and evolved his self made instruments, becoming one of the few glass harp players currently performing. One of his instruments is touring with Compagnia Finzi Pasca’s production “La Verità”, for which he was also glass harp consultant giving tutorials to their performer. During the last 10 years Robert has performed extensively for many different kinds of events, music and art festivals, theatre shows, gala events, schools, educational programmes, cultural events, museums, TV shows, documentaries, radio programs. Also special events related to glass or water, the fundamental elements of his music, like the opening celebration of the water exhibition at Phaeno Science Museum in Wolfsburg, the UNICEF water conference in Lugano, the 75th anniversary of glass manufacturer Sise-Cam in Istanbul where he performed with Turkish pianist and composer Fahir Atakoglu, the glass museum in Empoli-Florence. In 2009 Robert took part in “Bach & Friends”, a documentary about J. S. Bach’s music by American producer and director Michael Lawrence, featuring world renowned artists such as Joshua Bell, Hilary Hahn, Bobby McFerrin, Philip Glass …. Italian pianist and composer Paolo Marzocchi wrote “Fantasia Dell’Assenza” for piano, glass harp and orchestra. Robert first performed it with the Orchestra I Pomeriggi Musicali in Milan. Marzocchi also included the glass harp in the movie soundtrack “The Shadow Within” by Silvana Zancolò. From January to July 2014 Robert performed for Spiegelworld’s production “Vegas Nocturne” inside Rose.Rabbit.Lie. at the Cosmopolitan of Las Vegas.